Country’s largest airport celebrates arrival with rollout ceremony at African Airshow 2017. OSHKOSH, WIS. (November 28, 2017) – Oshkosh Airport Products, LLC, an Oshkosh Corporation (NYSE: OSK) company, has delivered three Oshkosh® Striker® 6 X 6 aircraft rescue and fire fighting (ARFF) vehicles to Kotoka International Airport (ACC) located in Accra, the capital of Greater Accra in the West African country of Ghana. Their arrival was celebrated with a traditional rollout ceremony at the airport, held in conjunction with the African Airshow, the First Annual Aerospace and Aviation Exhibition of West Africa. Integrated on the trucks is the Oshkosh-exclusive Snozzle® high reach extendable turret (HRET), with a hardened carbide steel tip, a perforated nozzle, and a forward-looking infrared camera. The Oshkosh Snozzle HRET is a game-changing firefighting technology that has proven its mettle with firefighting forces at many of the world’s largest airports. Each of the apparatus is equipped with Oshkosh TAK-4® all-wheel independent suspension for a smooth ride and exceptional off-road capabilities. The firefighting system includes an 11,356-liter (3,000-gallon) water tank, a 1590-liter (420-gallon) foam cell, and a 249-kilogram (550-pound) dry chemical system for multiple agent fire suppression capabilities. The engine power pack components are readily accessed through walk-in doors – on either side of the engine compartment – for easier servicing. The Oshkosh Striker, available in 4 X 4, 6 X 6 and a game-changing new 8 X 8 configuration, feature advanced safety systems, innovative fire suppression technology, unmatched chassis performance, and unsurpassed reliability and durability. 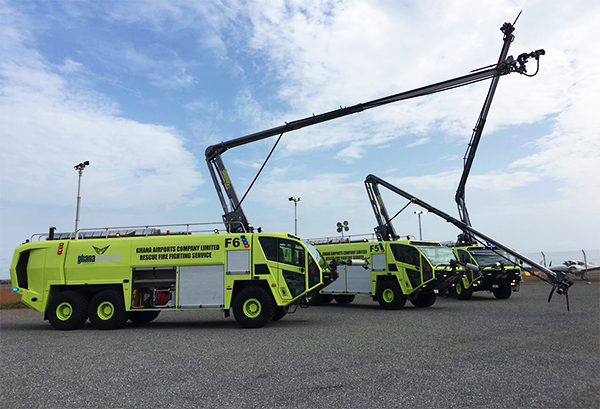 Photo caption: Oshkosh Airport Products has delivered three Oshkosh® Striker® 6 X 6 aircraft rescue and fire fighting (ARFF) vehicles to Kotoka International Airport (ACC) located in Accra, the capital of Greater Accra in the West African country of Ghana. Their arrival was celebrated with a traditional rollout ceremony at the airport.